Happy July, Readers! I’m hoping you all had a happy, safe Independence Day with people you love nearby and some yummy food in your bellies. We kept it pretty simple this year, since my husband was on call on the actual day. The 4th of July can be a dicey day for an on-call physician, as you can imagine. Alcohol + steamy temperatures + explosives? Not the most winning combination. We’ve had more rain lately that is normal for us, and boy, I don’t handle humidity gracefully. My hair goes whackadoodle curly and once the afternoon heat takes hold, all I want to do is retreat to the basement with Netflix and a cold drink. I don’t know how you folks in Florida or on the East coast handle those sticky, mid-summer days. I turn into a slug. Or a sloth. I also don’t want to heat up the kitchen when mealtime rolls around, and while it’s easy to throw some meat on the grill, I struggle a little with what to serve for a side dish when I’m overheated. Sweet corn is a staple, as is a simple tomato salad, but sometimes I want something with a bit more substance. I don’t want anything mayonnaise based–that’s just not appealing to me when I’m sweaty. Potatoes are easy but seem too heavy. I could just slice open a big watermelon and call it done, but it’s a festive time of year, and I want something that at least feels somewhat special. 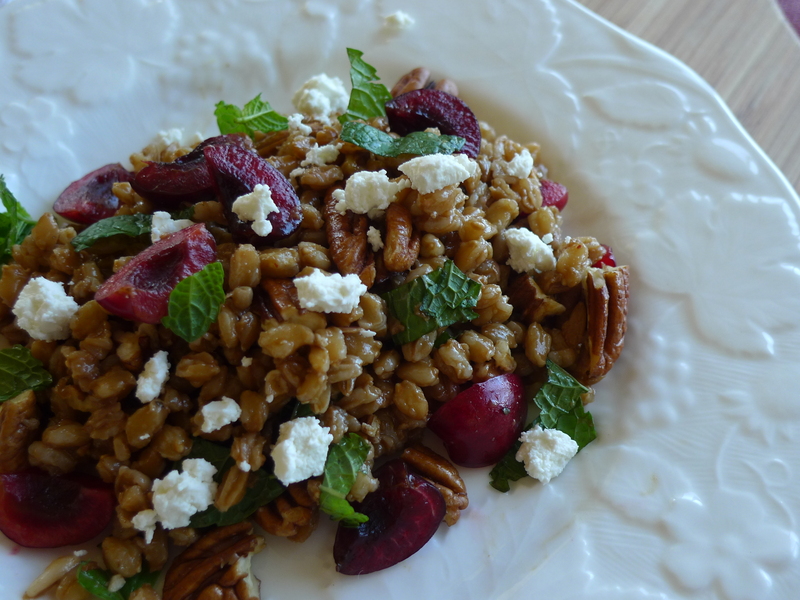 Since I’m rather farro-obsessed lately, I decided to do yet another riff on my standby farro salad. This one sounds odd at first blush, but it really does work, especially paired with grilled chicken or fish. I thought it was particularly brilliant next to a beautiful, simply grilled piece of wild salmon. Cherries are juicy and wonderful this time of year, and they complement the chewy richness of the farro. Feta or ricotta salata (or goat cheese) adds lusciousness, and lemon and fresh mint brighten the whole deal. Since I was going for a sweet/savory flavor profile, I ditched the usual balsamic vinegar in the dressing and used a raspberry balsamic–white balsamic would also work well, as would a tarragon vinegar, I think. I also backed off the amount of Dijon mustard in the vinaigrette. I added just a tiny kiss of it–enough to add a little funk but not overwhelm the whole dish. 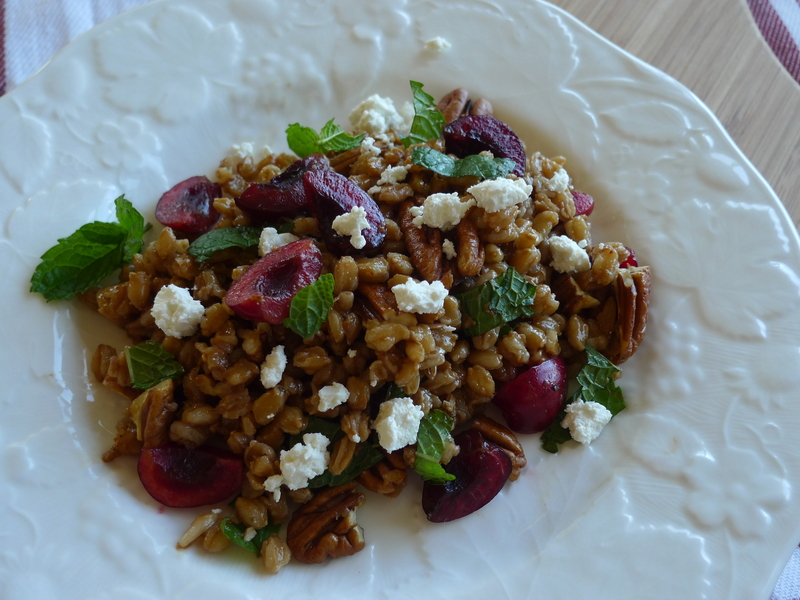 I cooked the farro early in the morning, while temperatures were cool, and then stored it in the refrigerator. Then I tossed everything together (except for the mint, pecans and cheese) an hour before serving and let it hang out so the farro could soak up the dressing and the flavors could mingle. Right before serving, add the finishing elements and there you have it. The most arduous part of this salad is halving and pitting the cherries, but it took me about 15 minutes of labor and the farro was cooking away anyways, so it didn’t bother me one bit. Pretty little thing, isn’t it? If you’re suffering through some steamy weather, give this summer salad a try. It’s refreshing and good for you, too. 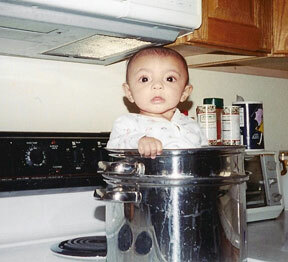 It won’t weigh you down, so you’ll still have the energy to set off those leftover fireworks after supper. You do have leftover fireworks, right? We sure do. My husband channeled his inner Daddy-o this year and came back with quite the haul this year. I don’t know what it is about Independence Day, but it absolutely, 100% brings out the inner rascal (man child) in the guys I love best. Luckily, they’re also 100% worth it. Bring the farro, broth and 1/2 teaspoon salt to a boil in a medium saucepan. Turn heat down to a simmer and cook for 35-40 minutes or until farro is al dente. Drain and rinse under cool water. Set aside. Blend shallot, olive oil, vinegar, zest and juice of the lemon, Dijon mustard and a pinch of salt and pepper together in a blender. Pour over farro and toss well to coat. Let sand at room temperature for an hour to allow the flavors to blend. In a large salad bowl, combine dressed farro, cherries and pecans and toss well. Add feta and mint and toss gently. Adjust for salt and pepper and add a bit more lemon zest to the top, if desired. Makes an inspired accompaniment to roasted chicken, pork or fish. Oooh! I love this variation! Cherries in anything are a win this time of year. Ben set off fireworks for the first time in our time together and seemed to really enjoy himself as well. Lol. I read an article on grain salads once that suggested putting the dressing on while the grain was still warm, saying it would absorb it more. When I have time I try this as it does seem to make a bit of difference. That looks perfect. You describe all the things I feel when it’s hot and humid and disgusting. This is fantastic. I might even stuff that into zucchini boats. Happy belated 4th of July wishes to you. We did the old person thing and stayed in this year. Getting used to this empty nest business! I recently discovered farrow and love it. Makes for a beautiful summer salad.